Who knew a few months or so ago that a broken iphone would snowball into a house full of iphones and more reasons for my nerves to be shot? So probably about 8 months ago my iphone 4 died. It was the free one I got when I had signed up for my phone plan. Nothing fancy, not a new model, I'm not into that stuff. Well, anyway, it died. I needed a short term replacement until my new one would arrive, so I bout a cheap, cracked iphone 4s off a buy/sell/trade Facebook page for $20 and used it for the couple days until my replacement phone arrived. The question arose of what I should do with the cracked one. The decision I made will forever haunt me. 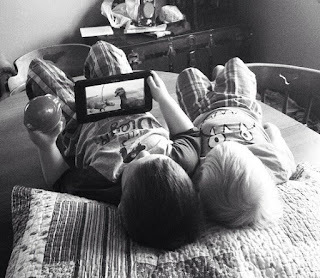 My youngest two when we had a small tablet. I decided to let my kids use it as a tablet. I deleted every app except YouTube Kids, Nick Jr and Disney Channel. The phone works with Wifi, but has no ability to call or text. Well, my oldest started utilizing the phone the most and began to treat it like it was "hers." This led to fighting and arguing, so I decided to find another used iphone that would serve the same purpose. I refused to spend more than $30, so I watched and waited on eBay until I got one. This phone was then mostly used by my two older sons for YouTube Kids. My 3 year old got in the habit of watching YouTube Kids on his dad's phone until he fell asleep, so this second phone would free up that "necessity." But then the three year old started labeling it as HIS phone and refused to let my 8 year old use it. He would have meltdowns and the works. Shortly after Christmas, my daughter asked me if she could use some of her Christmas money to add the Minecraft app to her phone. I researched Minecraft for appropriateness and then decided she could. Then she became addicted. Then my 8 year old asked me to put Minecraft on the other phone.... and I did. And then he and my daughter realized they could play together on separate phones. They both became obsessed... the "need" arose for another iphone so that the 8 and 3 year old wouldn't have to share. I turned to eBay again and started a quest for an iphone under $30. Now the oldest 3 all have iphones with the same four apps. Enter the 2 year old. He LOVES Paw Patrol and figured out that you can watch random videos involving Paw Patrol on YouTube Kids. The annoying thing is that he does not want to scroll through the available videos, he wants you to find a video and make sure he wants to watch it. Needless to say, I try to avoid him ending up with a phone because looking for the EXACT Rocky video he wants to watch is extremely annoying. And as of now, I am refusing to get another iphone! And if you're asking yourself why I am using iphones, it's because I have never had luck with tablets of any kind. They always crap out. I've had some that were just for me to use and I've bought a couple before that were built for kids... they all die or malfunction in some way. I'm familiar with the way the iphone works and it is user friendly, so that's why I'm sticking with it. Here comes the biggest headache: the obsession. My oldest two are OBSESSED with being on their phones. Generally it is playing Minecraft, but occasionally it is watching YouTube Kids. If it were up to them, they would be on their phone from sun up to sun down. We had to start new house rules just because of the phones... then add to those rules, then amend those rules, and so on. 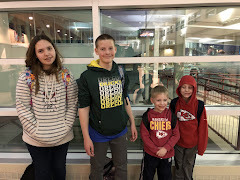 Currently, they are not allowed to get on them in the morning until they are completely ready for school, they can't have them from 5-7 on school days, 3-7 on no school days, not at all on Wednesdays and not after 5 on Sundays. It had gotten to the point where they would CRY if they got the phone taken away. They wouldn't eat breakfast in the morning because they didn't want to lose time on their phones. My 8 year old has literally walked into the walls while on his phone. It is ridiculous. Call me a pushover, judge me how you will, but I don't think that this is any level of bad parenting. And I'm sure a lot of you reading this are probably thinking my complaint is pretty mild compared to video game and phone obsession among many many kids today. I have told my older two that they don't get their own working "real" phones until they are 15. I plan to stick to that. What about your kids- do they have phones, tablets, etc? How do you feel about the amount of time they spend using this technology?